PORTEmaus: Oh Potter, Your Series is not as Dark as They Say But You Improve as You Go. Oh Potter, Your Series is not as Dark as They Say But You Improve as You Go. I suppose that I should preface this entry with a confession... 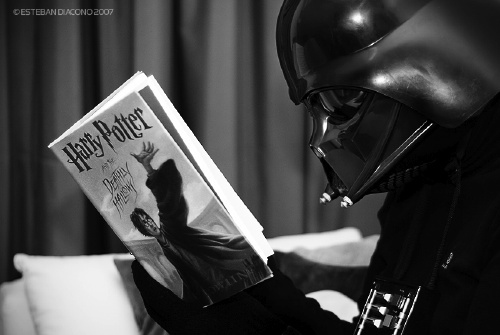 I enjoy Harry Potter. I have read all seven books (the first five twice) and I am not ashamed of that fact. Before I am written or cast off as a adolescent fanboy, let me explain. While the series is far from being "Shakespearean," I see (but also welcome) the intelligence, possibility and its ability to get children interested in reading without patronizing them. This is not something that one could say about the Twilight series of books and films. Harry Potter as a film series has been very hit or miss in my opinion. The first two (also known as the Columbus era) were downright awful and did the exact opposite of what I thought was positive about the source material. Then Alfonso Cauron waltzed in, worked his magic and created a film that was in a class of it's own. The fourth was a step back (This too was an awful mess) and Mike Newill had no business anywhere near the franchise. Yet, with the Fifth through Seventh (Part I) incarnations, the viewer is awarded with a worthwhile movie going experience. 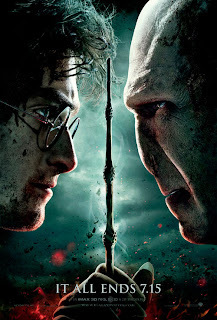 Harry Potter and The Deathly Hallows Part One is a step above it's predecessor. Am I irritated by the fact the executives at Warner Brothers wanted to milk as much money out of the franchise as possible? Slightly... Yet, if Part Two is as entertaining as Part One then you have to grant it a free pass. Only time will tell if this will be true. The easy thing about discussing a film within a series is whether it is consistent. Deathly Hallows from an acting perspective is on the same level as the films that take place before it. There is not much to say about the story. Potter is on a mission to destroy the dark Lord Voldemort and ultimately it will bring the trio of Weasely, Granger and Potter closer together (although with a measure of bitching and bickering). Voldemort seeks to obtain the elder wand and like all tyrants... Destroy all life as we know it. After all, he is a charming fellow. Overall, the film is an improvement over it's predecessor. The cinematography is superb and the action keeps the viewer interested (at least from my perspective). Not much is accomplished in the realm of plot (at least some deaths of minor characters), as it is waiting for Part Two. If you have a few hours to spend watching a film then you could worse. It is one of the better entries... Also, I would pay Chris Columbus to stay away from a film camera or perhaps I should take a restraining order out on behalf of the medium of film against him. Oh, but the Cauron one was excellent. yeah, personally, I'd rather have Children of Men than another solid entry in the Potter series. Lol... The Cauron film is one that transcends the series and yes, I would rather have another Children of Men than a Potter film. I think the best way to explain my feelings is that I like it because it was able to get kids to read when they probably would not do it otherwise. Is it in the pantheon of fine literature or film no. It had potential to be good, if a better writer had tackled it.